17. Pierce - The Story of ""Bleeding Kansas""
We are nearly to the end of our second time through This Country of Ours by H.E. Marshall, and I'll be sorry when we reach the end, for it has been a fascinating journey. The first time we went through the book, I read aloud to our older children. This time we are using Alcazar Audioworks' unabridged reading of the book on CD. The book, just shy of one hundred chapters, is divided into eight volumes of CDs so that you only need to purchase the portion that relates to the particulars of your study of U.S. history. That's a help to the budget! 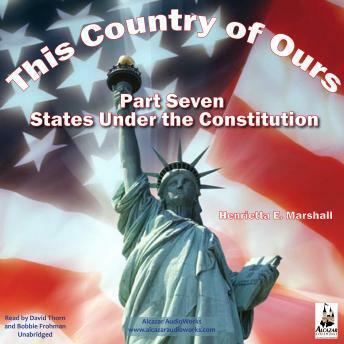 Part Seven A: Stories of the United States under the Constitution opens just after the ending of the American Revolution, describing how George Washington, having stepped down from commanding the young nation's army, was called out of retirement to be its first president. The stories continue through the administrations of the next fourteen presidents, through the beginning of Lincoln's first term, and the war between the Northern and Southern states, culminating in the battle between the Monitor and the Merrimac. You'll hear about Lewis and Clark, the War of 1812, the Monroe Doctrine, ""Tippecanoe and Tyler too!"" and much, much more. With our students listening to history this way, I get to be a listener, too. I like the fact that we can be folding laundry or washing dishes while doing our history reading! The CD are divided into tracks, making it easy to break up the reading and have the listeners tell back (or narrate) what they've heard. Two readers alternate, helping to keep the listener's interest; Bobbie Frohman and David Thorn do an excellent job of infusing life into an already well-told story. H.E. Marshall, the author of This Country of Ours and other history books for young people, was a gifted storyteller with a passion for her subject. Her writing, though full of historical events, dates, and facts, is never dull nor dry, being a series of stories about individuals and the events they shaped or found themselves caught up in. To get an idea of the book, look for it online as a free e-text. These are not merely names and dates, places and events, these are stories about real people, vividly described. A note of caution: As This Country of Ours was published in 1917, it does not meet today's standards of political correctness. For example, Native Americans are referred to in places as ""Redmen."" The story of the Mormons, presented in a chapter set during the presidency of Buchanan, though based on historical accounts, does not agree with the official record as set forth by the Mormon church.